So, as most people know, LiveJournal seems intent to concentrate on Russian-speakers as their main audience and release all relevant information only in Russian. To balance it out I've decided to translate all relevant information into English when I see it. 3. switch to beta-server on http://www.livejournal.com/betatest.bml (click big blue Go To button). If you're not a member of lj-ru-beta, this page will only display “You are not eligible to enter the test server.“ warning. If you've switched successfully, the page will reload and will have BETA BETA BETA written at the top. If after you've switched you still don't see the new comments, open http://www.livejournal.com/customize/options.bml and switch Disable customized comment pages for your journal option to Yes and Save changes. To go back simply switch back on http://www.livejournal.com/betatest.bml . Supposedly flushing your cookies should work, but better be sure. Check out Friends Times. It'ss a relatively new feature currently available to members of friendstimes. After you join the comm, you'll be able to see entries your friends have commented on on URL http://YOURUSERNAME.livejournal.com/friendstimes (replace YOURUSERNAME with your actual username). I might add translations for this if I have time. [new Scrapbook is ready to roll]There's also new Scrapbook in the works. Preview available in http://lj-pics-beta.livejournal.com/. All Plus, Paid and Permanent accounts will have access to the new version after joining this community or http://lj-ru-beta.livejournal.com/. So as a belated New Year Resolution I've decided to deal with all my email and blog accounts. And haha turns out this journal is my most popular one (although the percentage of humans messaging and commenting is somewhere around 0,01 - I've got approximately 5000 spam comments). I'm sorry for falling off the face of the Earth - work was much too busy and it seems that my email forwarding wasn't working so I wasn't getting any notifications. So if you messaged me and I didn't answer - I apologize. Sooo yeah, I can't promise that I'll pick up translations again, but I'm going to try. 1. Russian Federal Surveillance Service for Mass Media and Communications (Roskomnadzor) sent notices to YouTube, LiveJournal, and four other websites demanding that they cease the "illegal" publication of Russians' personal information, or shut down altogether. 2. The court of Yaroslavl city declared that all access to LJ should be blocked because some LJ page has published extremist content. Unfortunately there is no more info on that in English, but basically Russian Internet understandably freaked out (and I think LJ did too, a little bit). So igrick takes time to give some explanations. First about hysterics story with Roskomnadzor. We managed to learn the truth of the matter after contacting the federal agency itself. This is simple as 2 cents. There was a complaint from one LJ user about another LJ user who had published first user's personal information without their consent (for trolling purposes). Abuse Team had already blocked second user as per Invasion of Privacy part of Abuse Policies and Procedures. However they've registered under different usernames and continued to violate the rules. First user gave up and took their complaints to Roskomnadzor. I will not disclose this person's username but will mention that they are not a popular blogger. I should mention that Roskomnadzor really did send us a paper letter to our USA office - I think we'll get it in about a month. Email was only sent yesterday but unfortunately it was sent to a non-existing address. Well, at least now everyone knows how and were such complaints should be made so I consider this case closed. As they say: page one story didn't happen. Now about Yaroslavl. We have learned about it from mass media. Prosecution appealed to court, court passed the ruling, internet provider closed access. We were not involved in the proceedings and were not aware of them. We are going to investigate this, of course. If there any hate speech (as defined by Hate Speech section of Abuse policies) is present, the journal in question will be suspended without any hassle with courts and other prosecution. All this will be clear as soon as we see the court's ruling - if we will be able to see it. Right now we do not know which journal has violated the rules. And in regards to technical side of the question: IP only has the ability to block LJ as a service in it's entirety but not the specific journal. They can't really filter http traffic, can they. Upd: If the screenshot of court's ruling that is being passed around online right now is real then it's really something. I will keep you in the loop on this. This is a translation of this entry by igrick. It's two weeks old, but it looked interesting enough to me. Folks, me and tritankista were discussing how to implement the dynamic lj-cut expander we're working on right now. - no need to collapse the cut back. What do you say? How do you see it? Plans to add the ability to comment without opening a separate page ( tritankista here rus). Thoughts of making a setting that will always open all lj-cuts on friends page ( tritankista here rus). Currently it can be done via console as described in this FAQ entry. Bloggers that use ratings and other promotional instruments to get money for their blog posts have suggested to count lj-cut expanding as a viewing of a post. This is a translation of this entry by igrick. — Why do you call your software "beta"? — 'Cause it's beta than nothing! 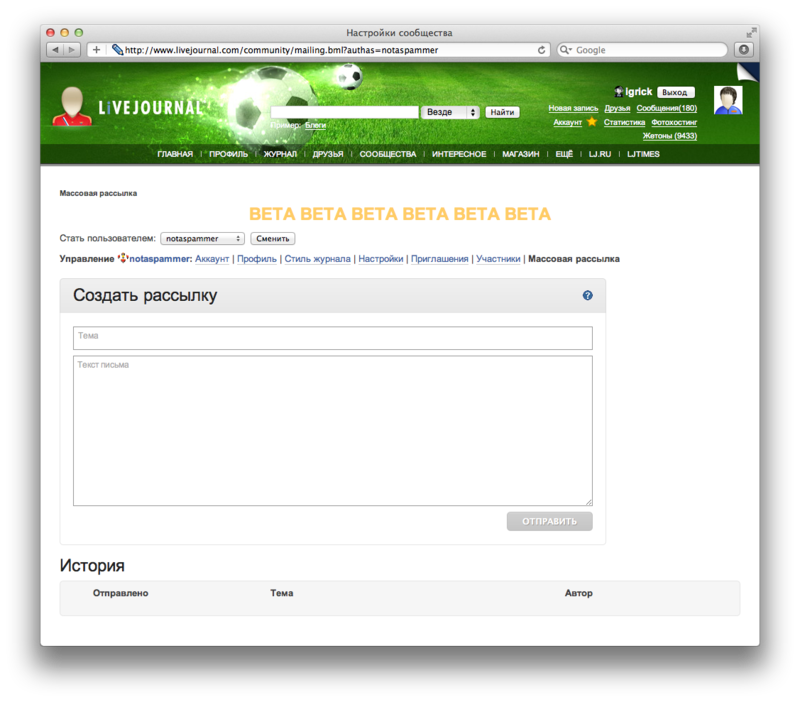 Folks, today release LiveJournal v.93 went into beta stage. Just in case I want to remind everyone (especially journalists) that this means that this release will be available to everyone only after the end of beta testing sometime next week. * Owners and moderators of paid communities now can send mass emails to all community members. All emails are sent in plain text and from: CommunityName@livejournal.com. Only one mass email may be sent in 24 hours. Members can choose to not receive mass emails from community but by default everyone is subscribed to them. Please note that during beta-testing actual emails will not be sent. A screenshot of "Create a mass email" page can be viewed here. * New repost mechanism is here: instead of creating a copy of a post Repost button will now insert the original post into the journal of reposter. All comments and traffic will go to the author. That means that rating will always take into account original posts, not reposts. Rating will now consider the number of reposts as well. Please note that during beta-testing this button will be visible only to users in beta and all posts created with it will look like old reposts with links to original post to everyone not in beta. * New Promo block will appear on main page. This one will be controlled by LJ itself. It will feature posts that we recommend and communities and users we want to support. * Social Capital amount will now be displayed for all users regardless of their participation in ratings and/or subscription to Cyrillic services. * All users with Social Capital over 15 will not be required to fill in CAPTCHA when commenting - regardless of journal settings. * For suspended accounts we will display the cause of suspension in some cases - for example, in case of copyright violation. It will be displayed on the page with information about suspension. * We are still cleaning up our to-do lists and will close the wish-list project in this release. CAPTCHA requirement is removed because there should be no bots with social capital over 15. Repost button at the top of the entry will be switched over to the new Repost mechanism after it is tested. All comment notifications for the new Repost will be sent to the author of the original and not to reposter. If you're trying to create an album in your Plus account and are getting suggestion to buy Paid account first, that means your account is still being transferred to the new Scrapbook ( manu here rus). Android client will be able to continue uploading pictures to the new Scrapbook without being updated ( tritankista here rus). The space-counting widget that displayed that Permanent account holders were out of space will be fixed in the next release ( manu here). There supposed to be a log where all pictures that had security level changed will be listed ( coffeechica here). Secondly, when you get your email notification of migration of your photos, there will be a link to a migration report. This shows links to the images that failed to be moved. The links to these do not work but if you add / to the end of each link, you will get a smaller version of the lost picture SOMETIMES. Images on the new system are still missing for some people. There is no information on where the images that were corrupted in the old Scrapbook were located (here). Many people are reporting that pictures were migrated to wrong albums. There are some issues with usernames with trailing underscores. Engineers are looking into it. Logged-out users can see the list of ALL albums regardless of their security. They can't see the actual pictures inside, but names of the albums are visible (confirmed as a major bug by coffeechica here). Remaining space info is not updated after albums or pictures are deleted. No way to select an album to upload to during upload. Tags will be saved in the database during the migration and will reappear in the interface later on ( manu here). Explanation on why Scrapbook is being changed here. [tag info up until now]No more tags (no info on whether they'll come back or not). People are very upset over this. Very. Upset. Hopefully someone from LJ Team will say something on this topic soon. Preferably "Yes, we're working on bringing tags back). So far manu only said here that it MIGHT be implemented in future versions. You can move images around one by one (quick how-to here) and rename albums (quick how-to here) and links are not supposed to break (said by fiddlingfrog, who's not in LJ Team but is reliable enough source, here). No sub-albums in the new Scrapbook (asked in several places and answered by manu here). Private albums are visible in the list of albums to a anonymous viewer, but they will work on it a bit later ( manu here). - navigation troubles (arrows don't scroll through pictures) (here and here). Entry last updated on June 1st. This is a translation of an older post by igrick. For more comprehensive and full list of lj-tags please refer to this entry by fiddlingfrog. Folks, when we've added lj-like option, some users asked us to give descriptions for all available LJ-tags. I've promised to do it, but unfortunately I only got time to do it now. Hope I'm not too late and this will be useful for you. That's all for now. I will be updating this manual as new tags will be added, so you can bookmark it if you want. Right now something is going on with LJ design - sometimes pages load without css and look like a jumble of white space and links. igrick said on twitter that it's because their Content Delivery Network provider is having servers failure. No info on when it's going to be fixed yet.